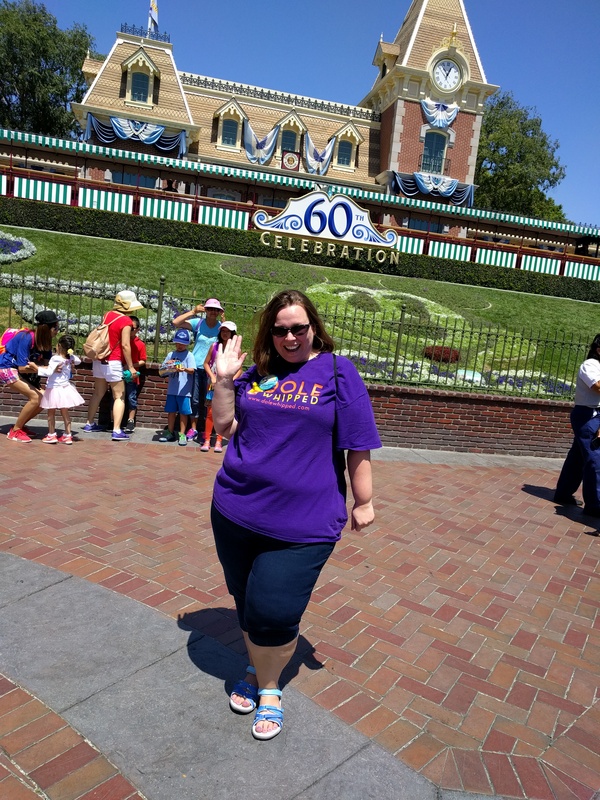 As you’ll recall, I had the opportunity to do an Agent Education Program at Disneyland a few months ago. 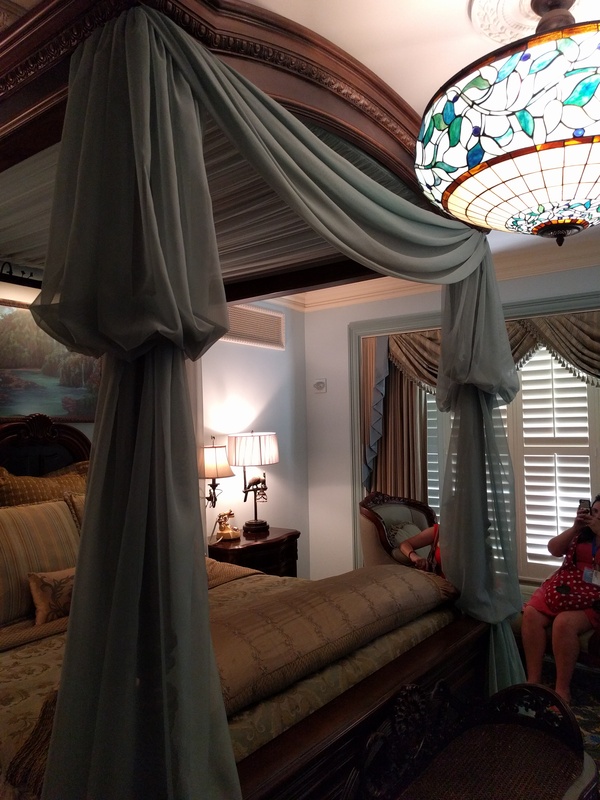 As part of the program we got to do a “Heritage Experience.” In Disney-speak, that means “You’re going to see something really cool and exclusive.” What we got to see is the Disneyland Dream Suite. Let me tell you all about this amazing hidden treasure! First, a little history. So, back in the 1950’s when Walt Disney was building and maintaining his “baby” aka Disneyland, he kept a little apartment above the fire station on Main Street USA. At that time, the apartment was fine because it was mostly just Walt and his wife and two daughters staying there. 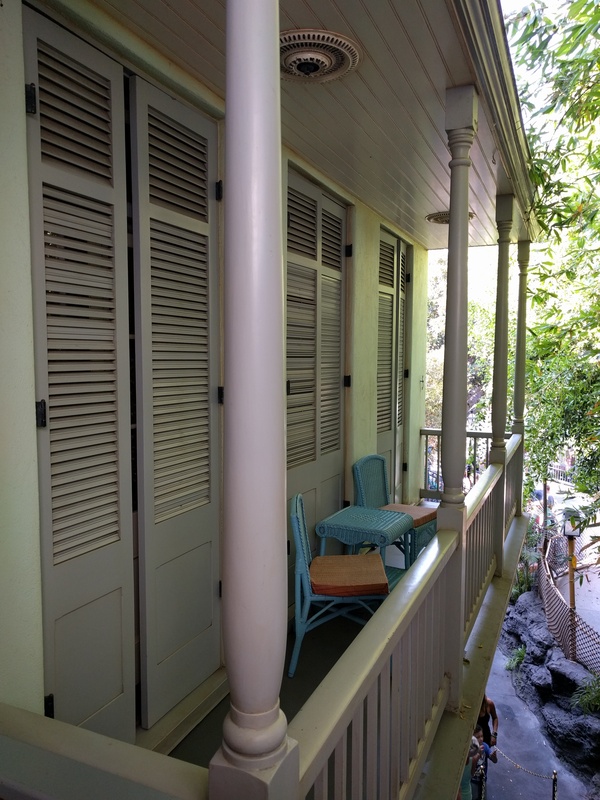 In the 1960’s, Walt felt like he needed a bigger space for his family and his daughters’ eventual grandchildren, and just a larger space for entertaining so he commissioned the apartment to be built right above New Orleans Square, which was already under construction. 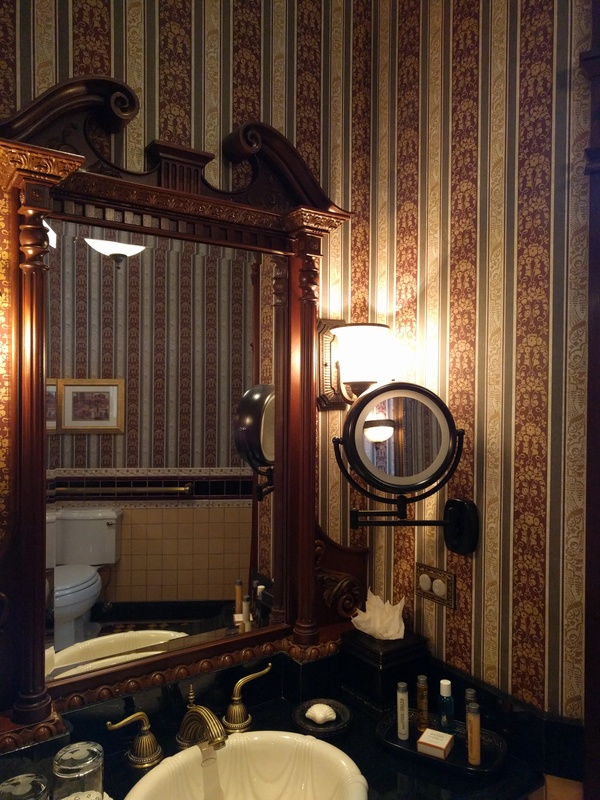 The Royal Suite, as it was named at the time, never saw completion as Walt passed away in 1966 and several of his ongoing projects were abandoned. The family felt too devastated by Walt’s loss to continue the construction, so even though the apartment was nearly finished, it sat vacant for nearly 20 years. 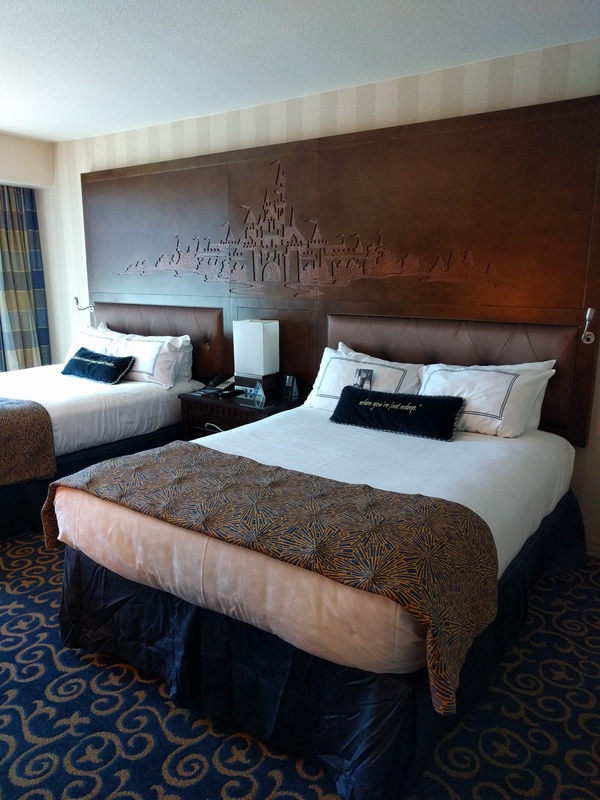 In 2007, Disney hosted their “Year of A Million Dreams” event and for that, the Dream Suite was renovated into an actual hotel room. 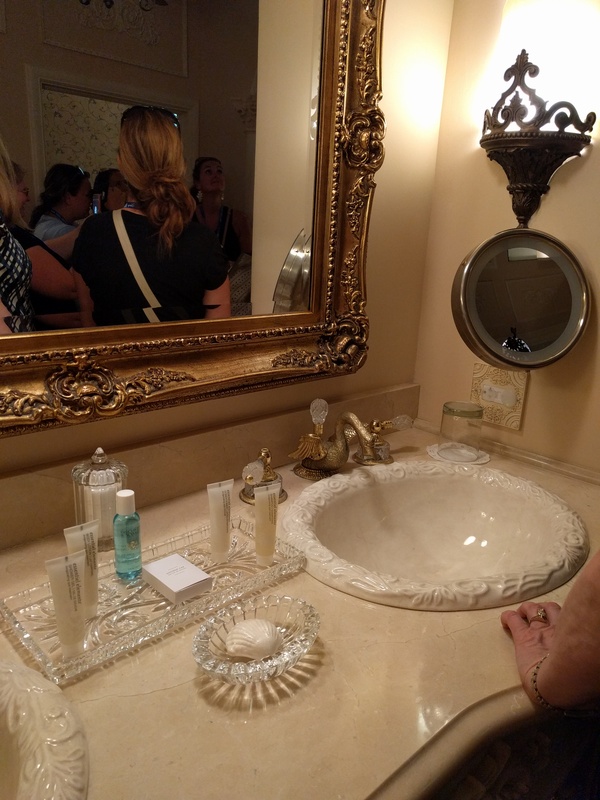 Winners were picked at random to spend the night in the Dream Suite for free. 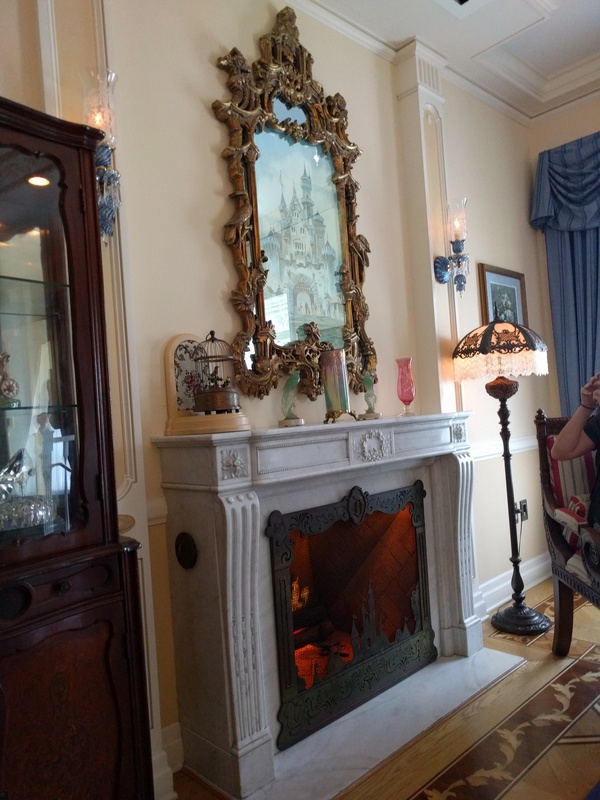 As with the room in Cinderella’s Castle in Walt Disney World, the Dream Suite cannot be booked. A stay there has to be awarded. Now the best part! Let’s take a look inside! 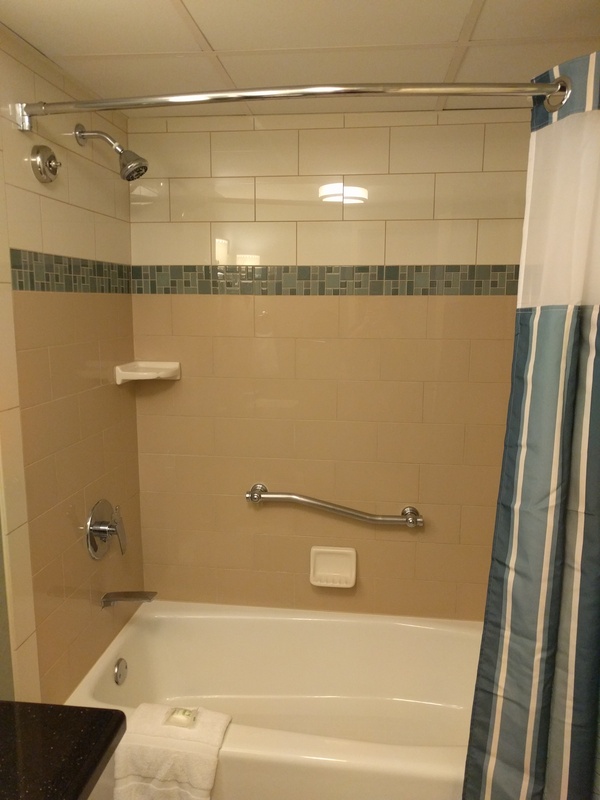 The apartment is two bedrooms, two baths, a living room and a little hallway. We entered via the hallway. 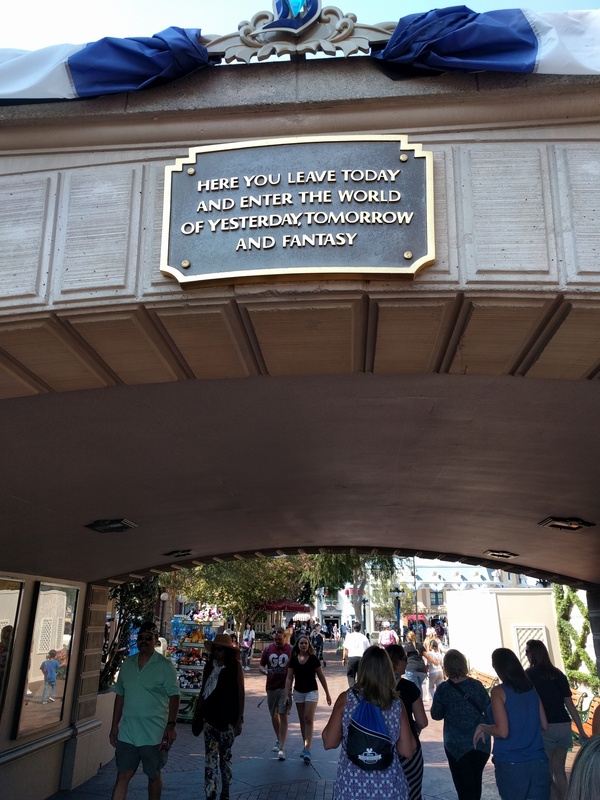 This is right as you come up the elevator by the entrance to Pirates of the Caribbean. The entrance door. 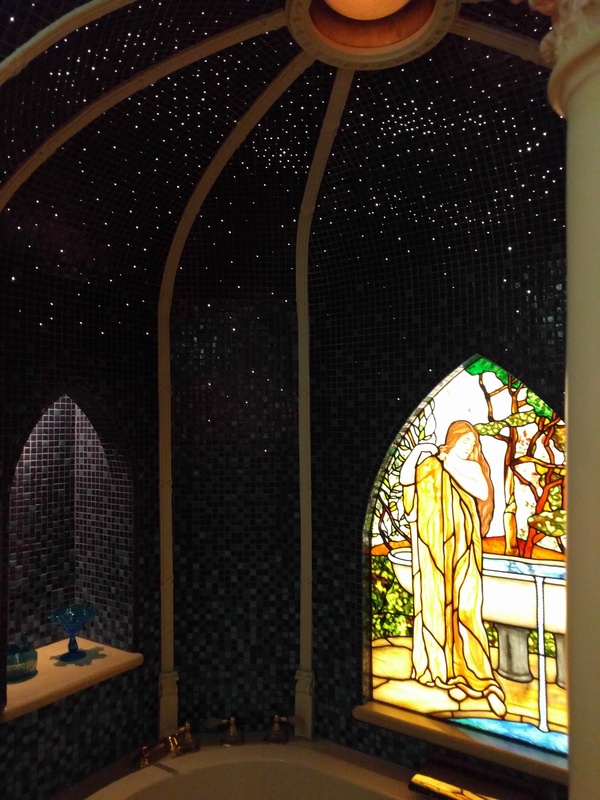 I loved the stained glass. 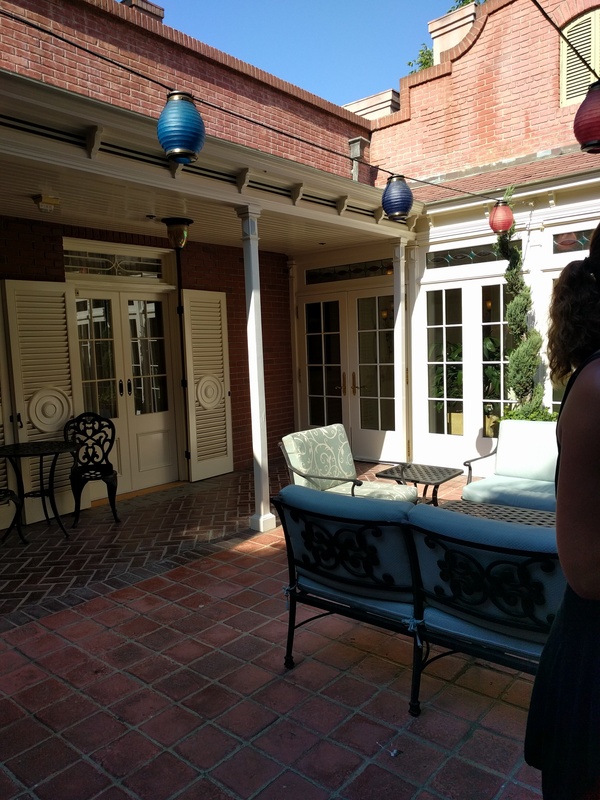 There’s a little courtyard located between the rooms. It was incredibly quiet in here despite the hustle and bustle of the park located below. 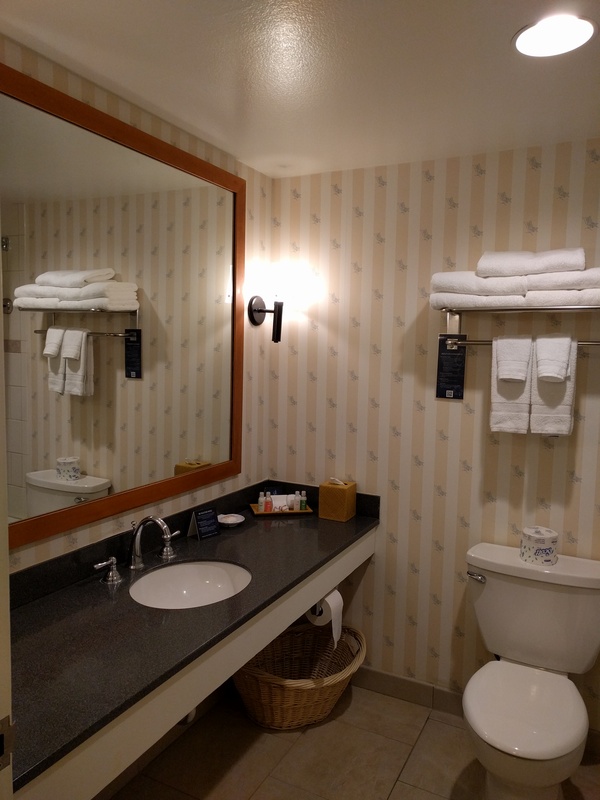 In fact, you couldn’t hear ANY park noise inside the suite itself! It’s all soundproofed! 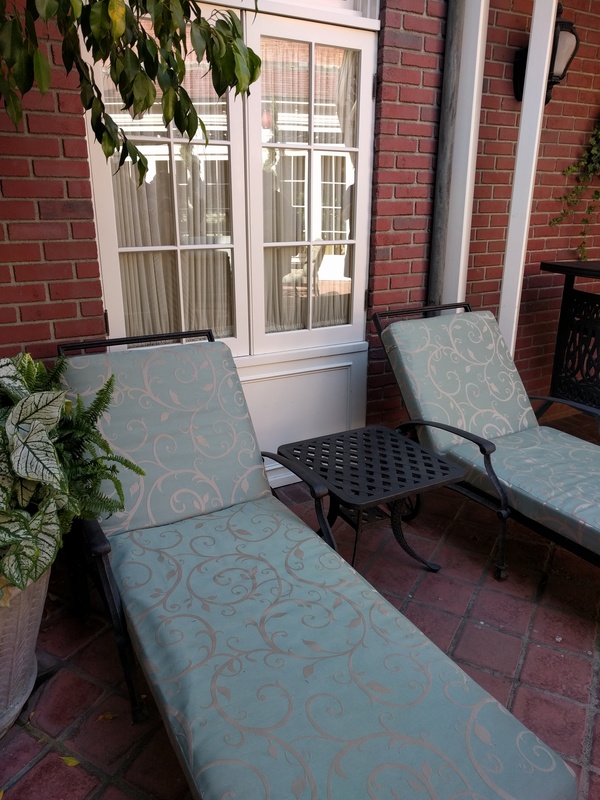 I absolutely adored the fabric on these lounge chairs! 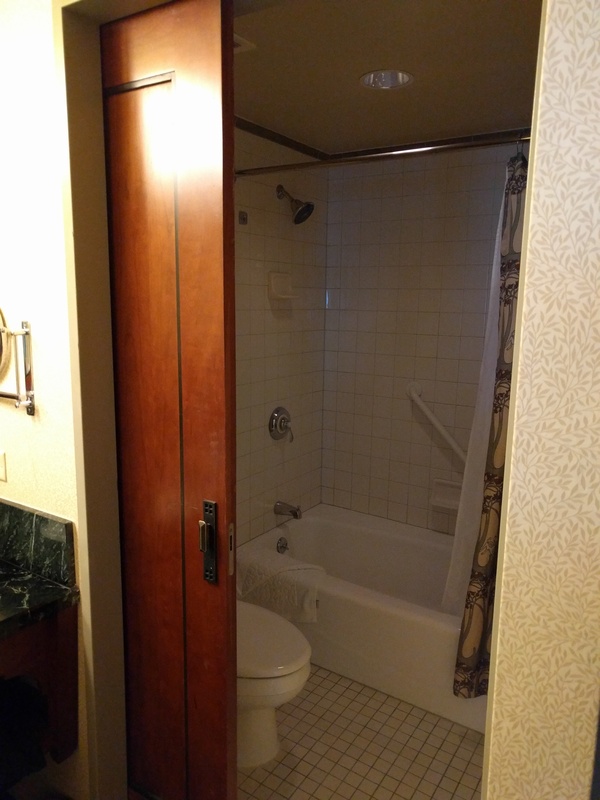 As I mentioned, there are two bedrooms with en suite bathrooms. 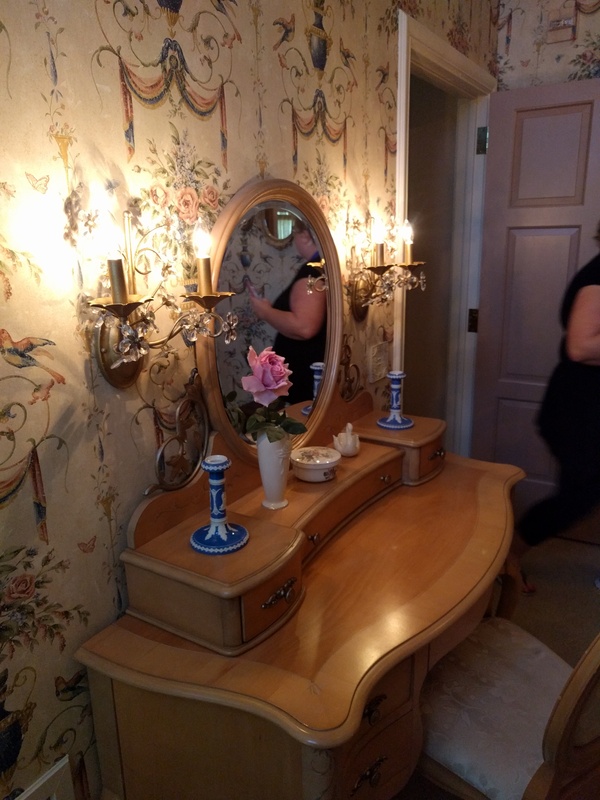 Each room in the house, including the living room are themed like a different park “land.” The first bedroom is Adventureland themed. 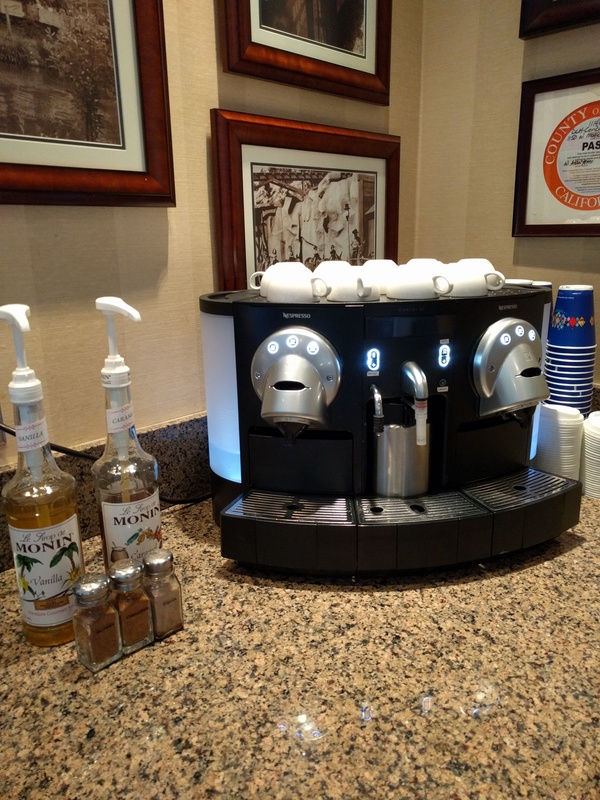 Now, it’s a beautiful room, but here’s where things get magical. 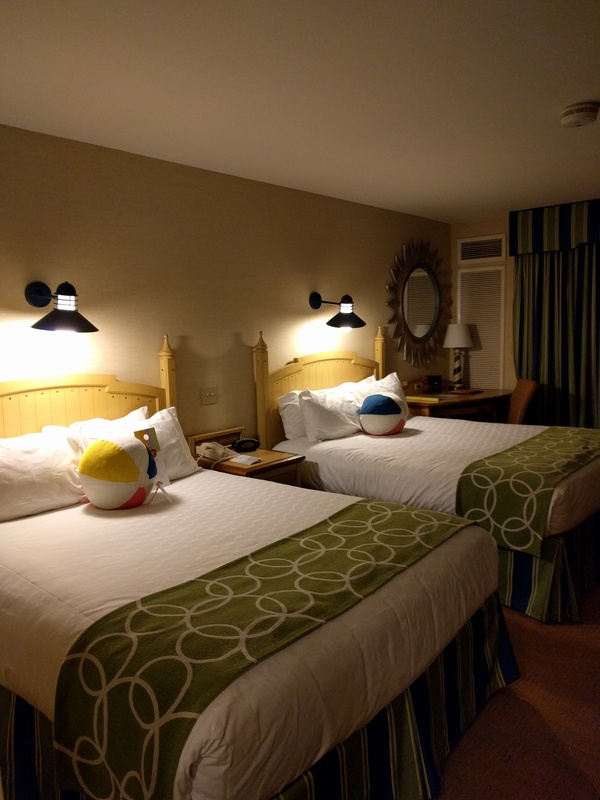 Each room has a “Goodnight Kiss” switch. When that switch is flipped, something magical happens. The lights dim, and music plays…it’s wonderful! In this particular room, a Peter Pan inspired light show happens. 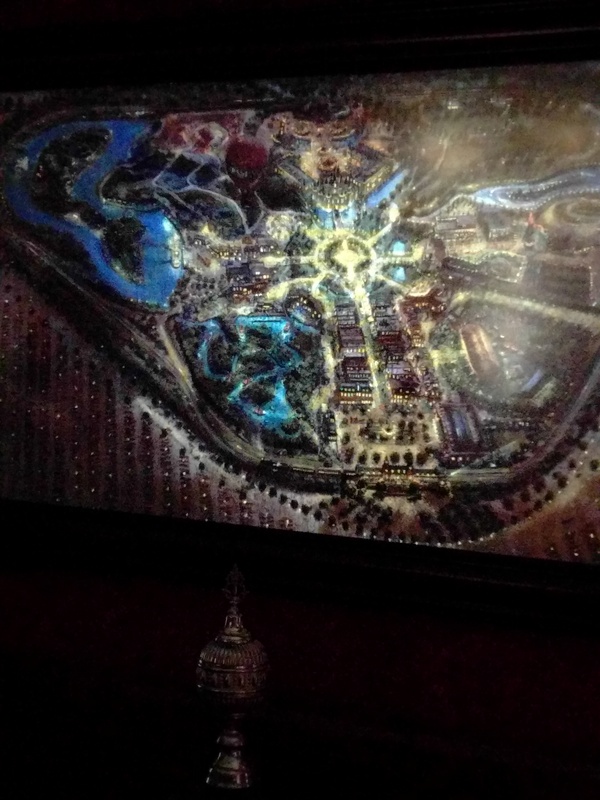 They wouldn’t allow us to take video of the magic and my photos didn’t come out well. But it was so breathtaking! 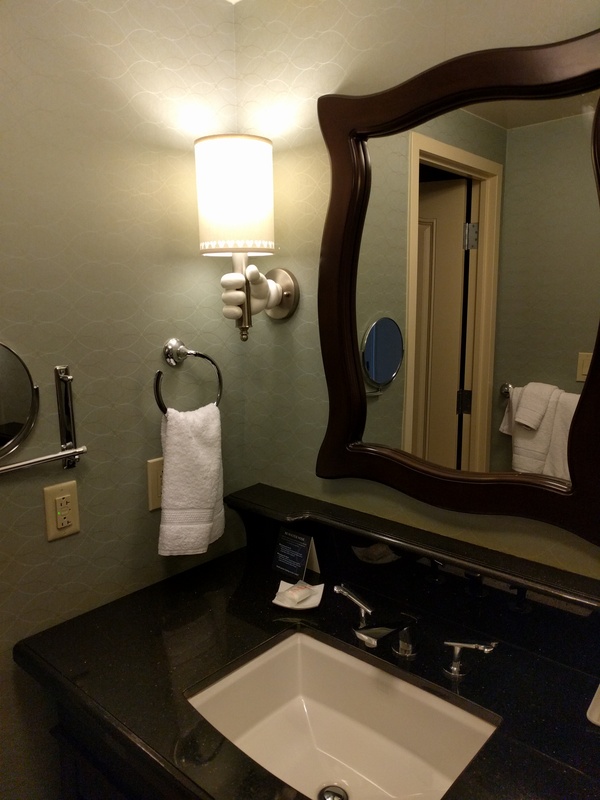 Of course, there’s magic in the bathroom as well. 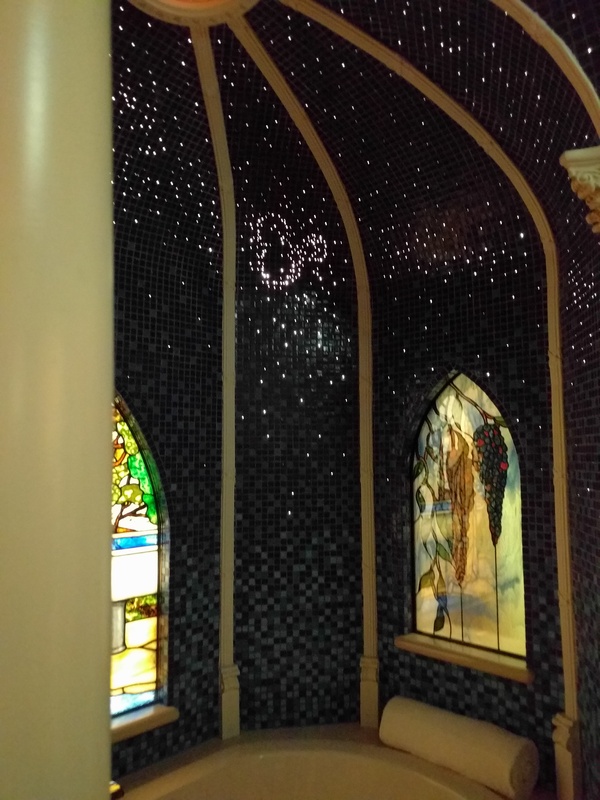 When the switch is flipped here, the tub surround lights up with twinkling lights and Hidden Mickey appears spontaneously! 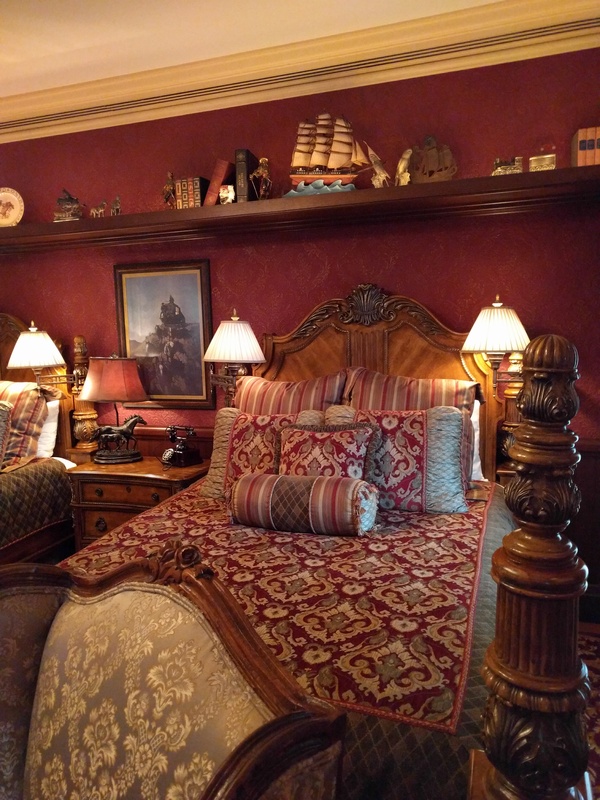 The second bedroom is Frontierland themed. It includes two beds instead of one so this is meant more for a children’s bedroom, I think. 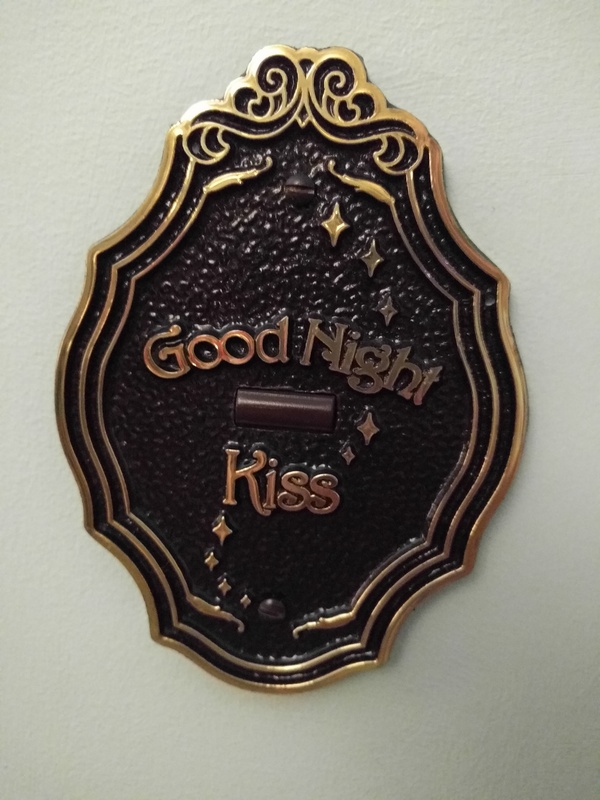 There is also a “Goodnight Kiss” switch in here which dims the lights and sends a little train on a trip around the perimeter of the room. 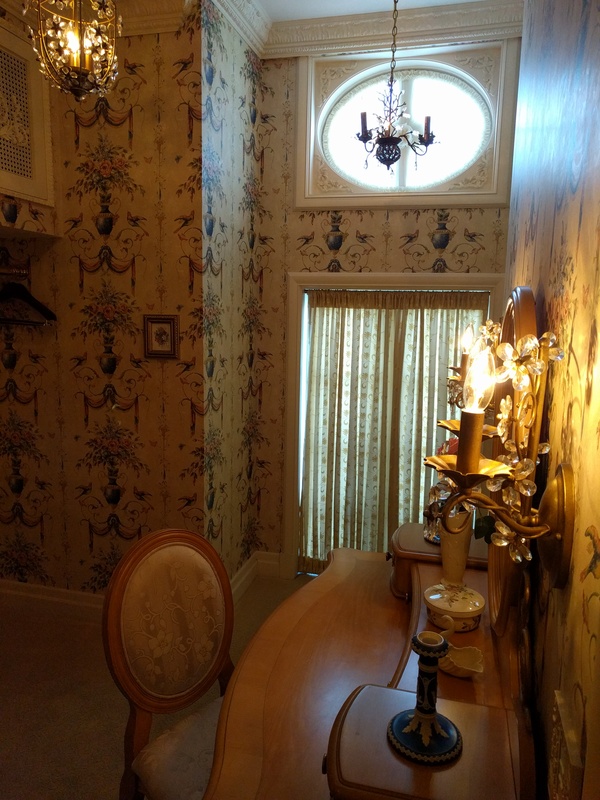 You can see the tracks located on the shelf above the beds. Each little vignette has some little touch of Disney inspiration and magic. …it lights up with twinkling lights and flowing water! 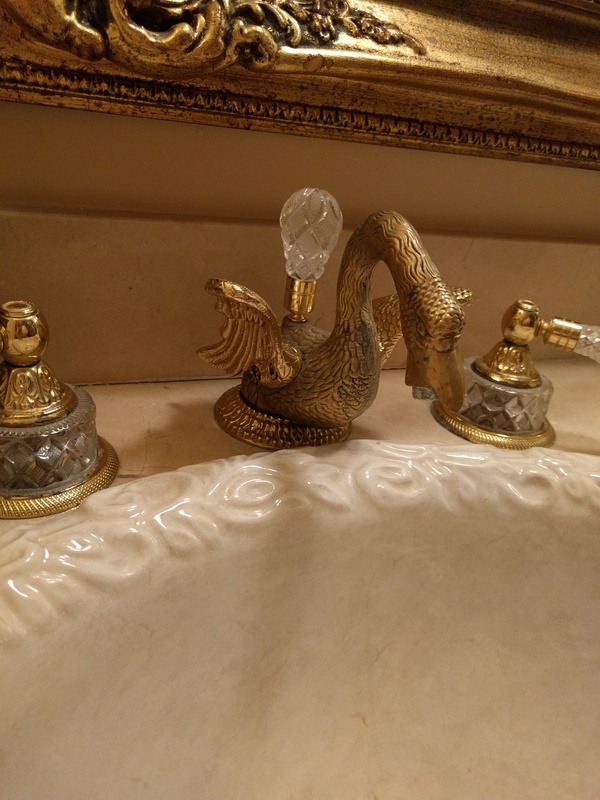 And the theme continues on to the bathroom. To the living room! 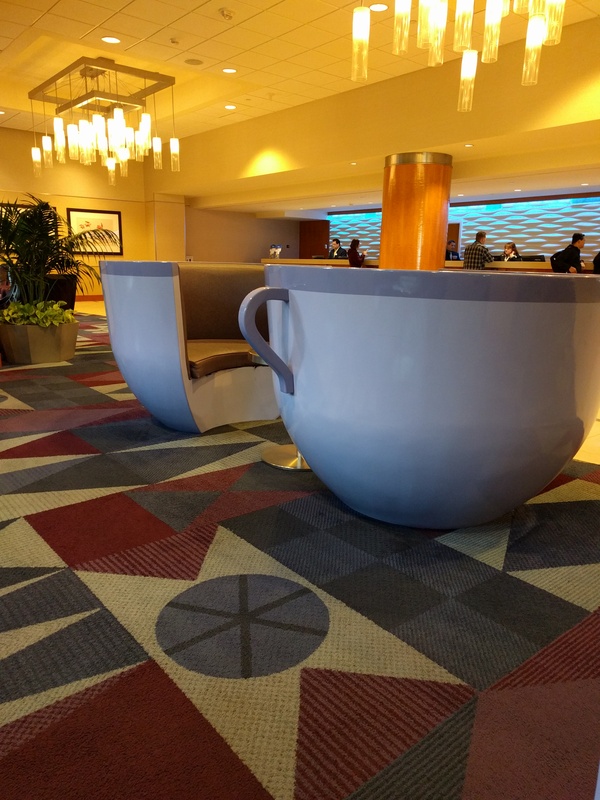 Check out this fireplace. 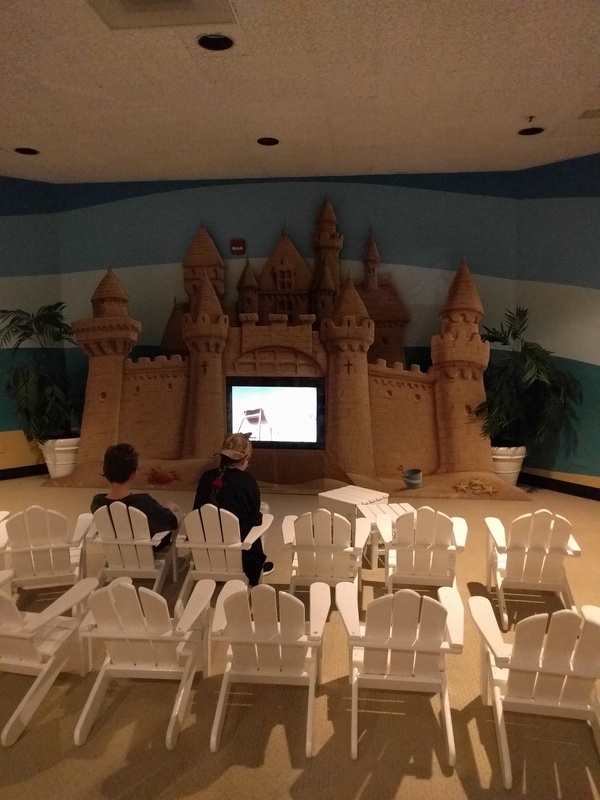 It’s not a real fireplace, but a screen with a fire video on it. Occasionally, the sparks from the crackling fire look like fireworks! Another interesting thing is the little birdcage on the mantel. That is a replica of a toy Walt purchased at a flea market. 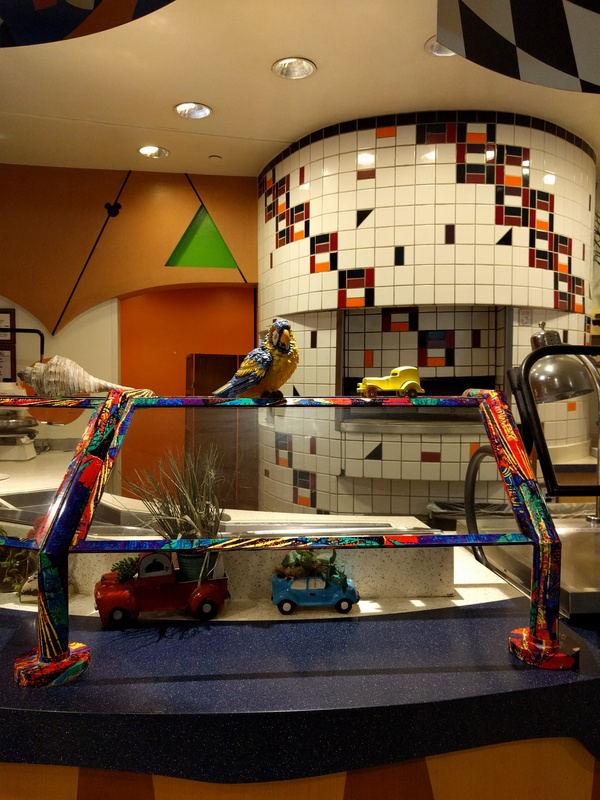 The bird inside was mechanical and when you pressed a button it would chirp. That bird was the idea that later became Walt Disney’s Enchanted Tiki Room! 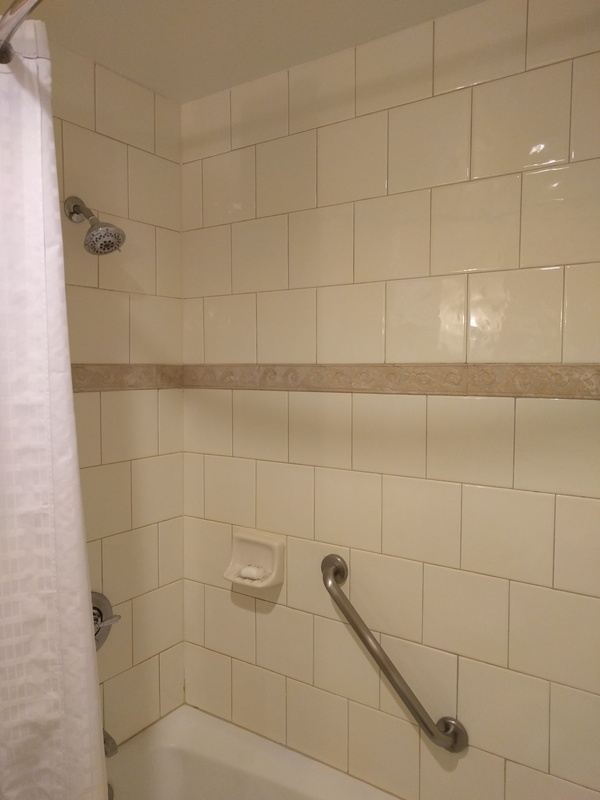 Just like all the other rooms, there’s a special switch in this room too. 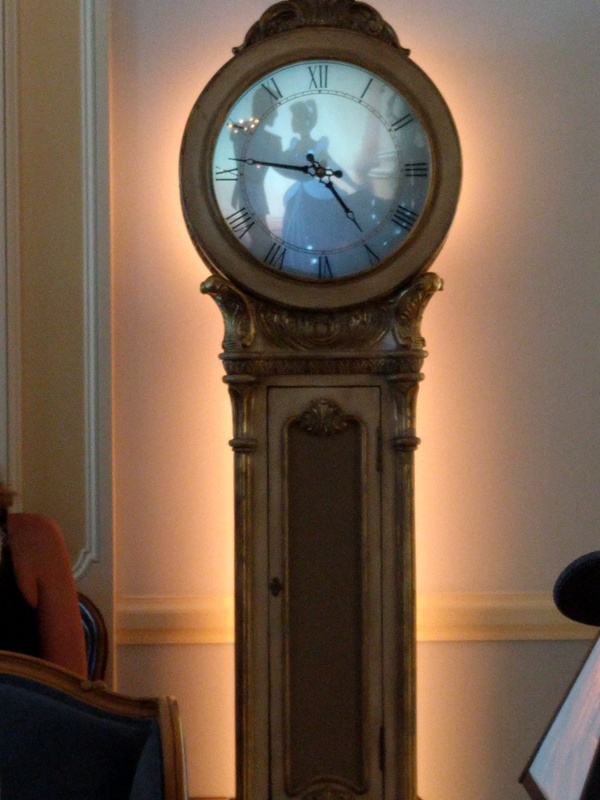 Here’s what it does to the grandfather clock! 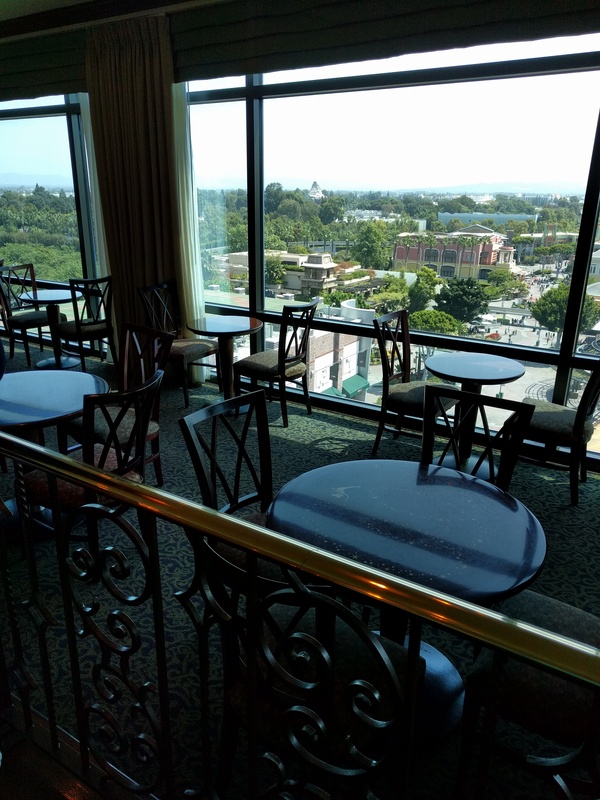 Possibly one of the most interesting things about this suite is the view. 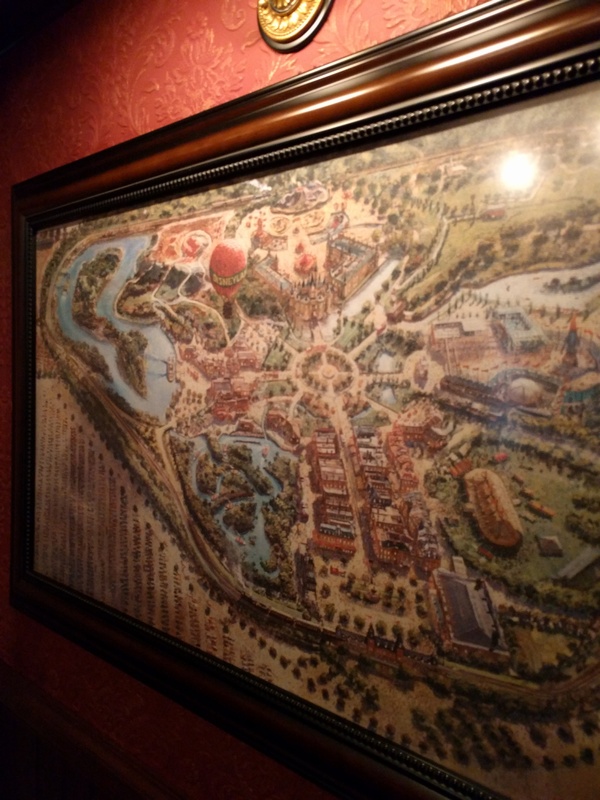 It’s located right across from the Rivers of America where Fantasmic is shown nightly. From the balcony of the suite, you get a dead center perfect view of the show. The other thing is that you can look down upon all the park goers and get a bird’s eye view of what’s happening, but almost no one looks up. That would have been perfect for Walt to have watched the happy folks in his park without being the center of attention. 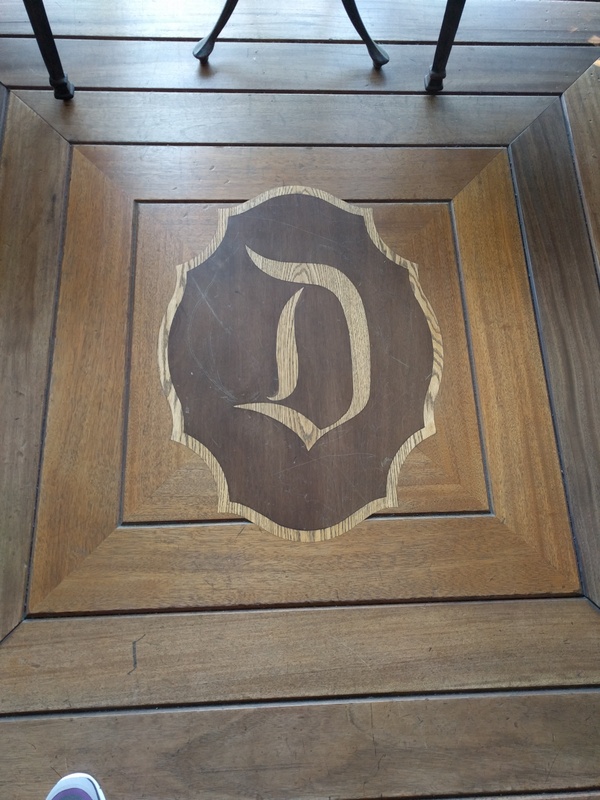 This insignia was inlaid into the wood of the balcony. Just beautiful! 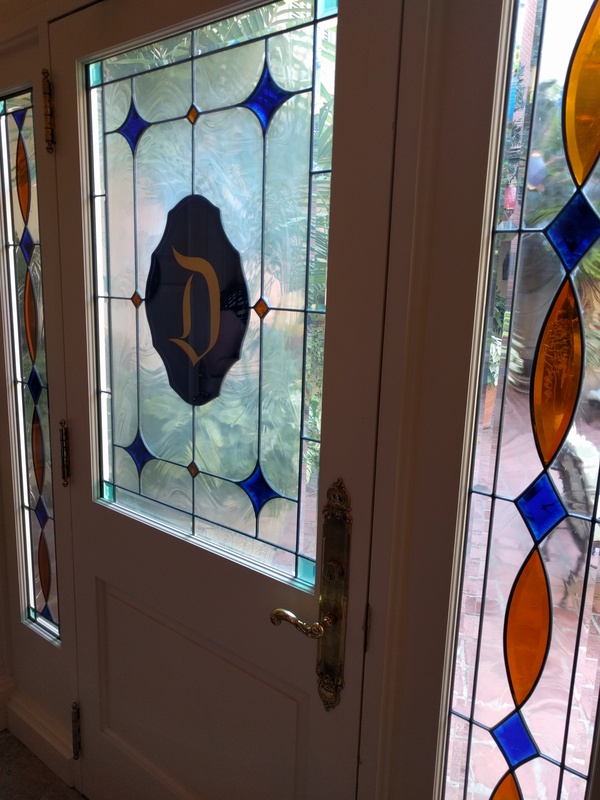 And that’s a very short overview of the Dream Suite at Disneyland Park! 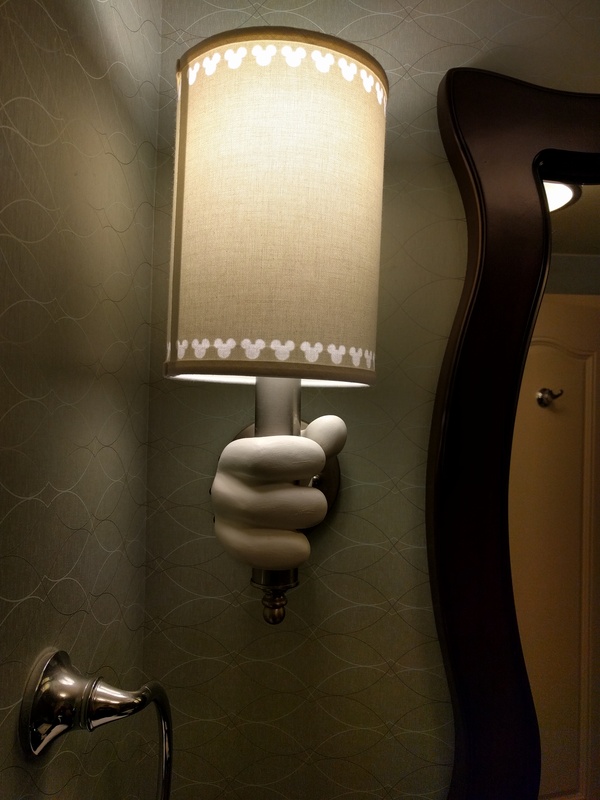 This is truly a Walt Disney fanatic’s delight! 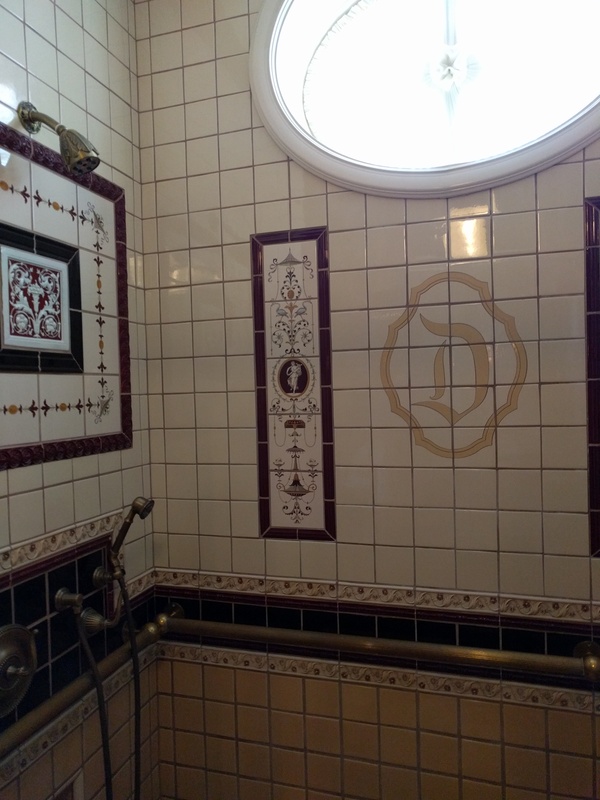 So much history and so much Disney magic all in one 2200 sq ft apartment! 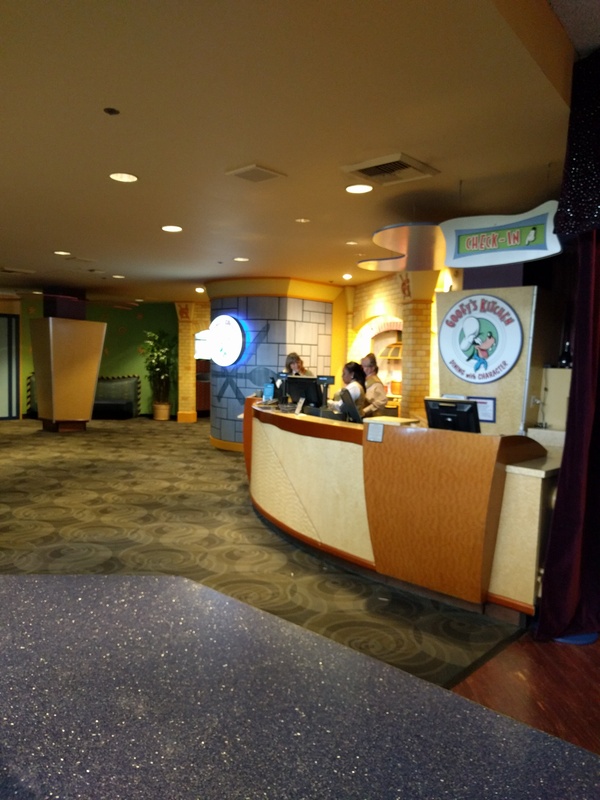 If you would like to see it for yourself, you can purchase a VIP tour during your stay at Disneyland. I highly recommend it! 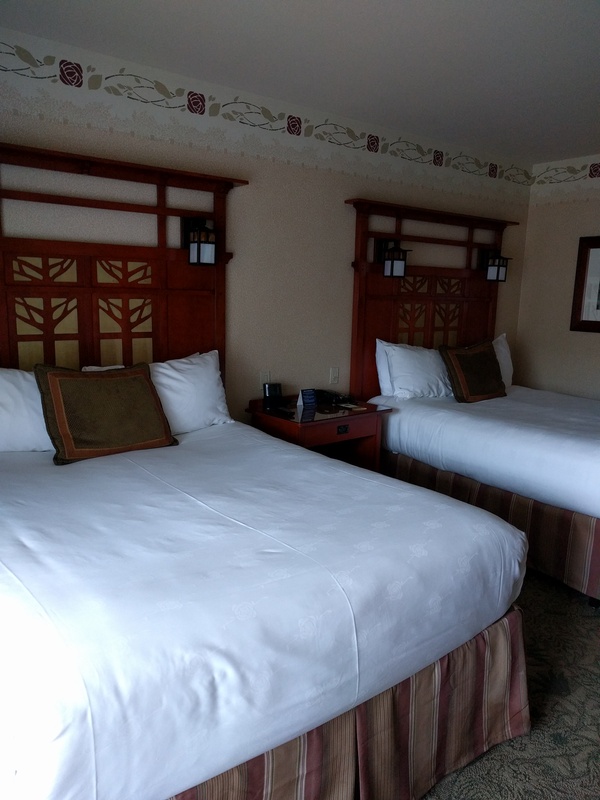 While I was recently at the Disneyland Resort I had the opportunity to stay in all three of their onsite resorts. 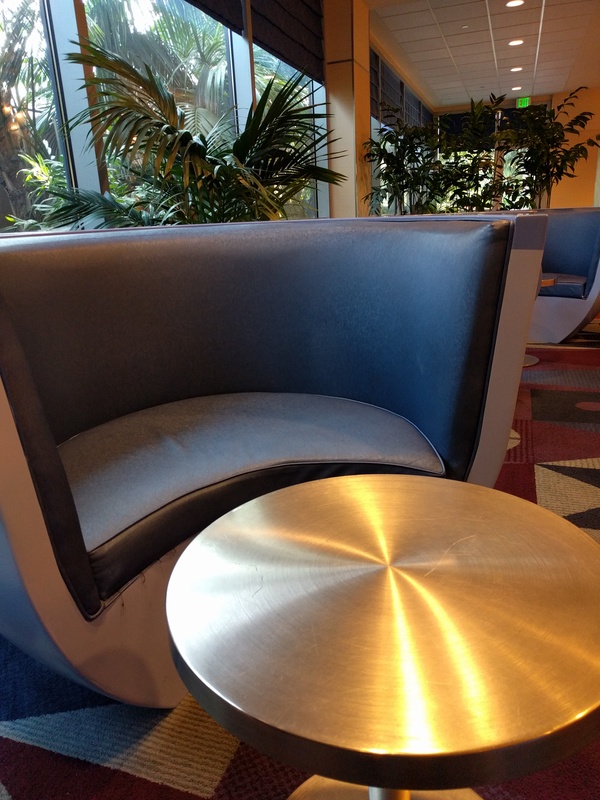 In this post, I’ll give you my thoughts on the Disneyland Hotel. 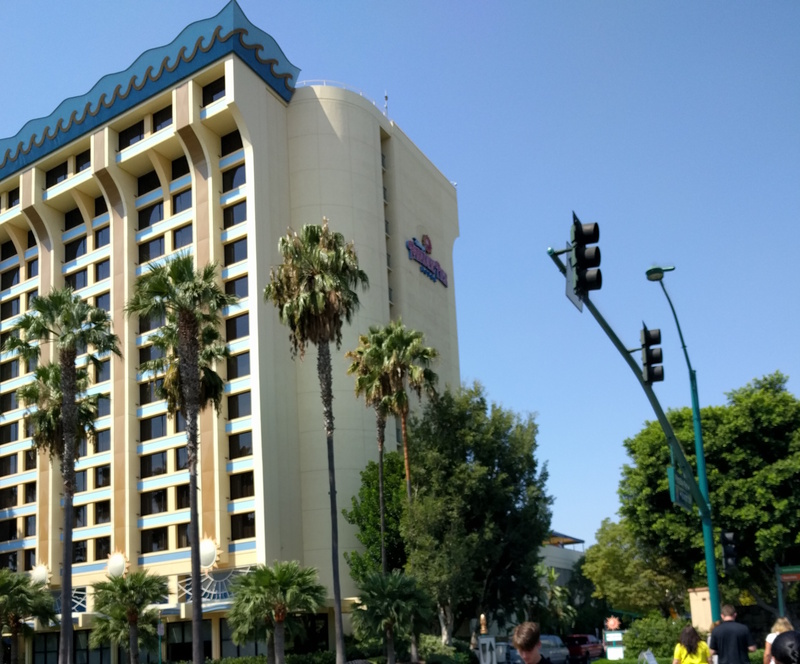 The Disneyland Hotel is the original Disney resort. Obviously, it’s had a few facelifts in 60 years, and I have to say I’m a huge fan of the look of this resort. It has a fun yet modern feel. 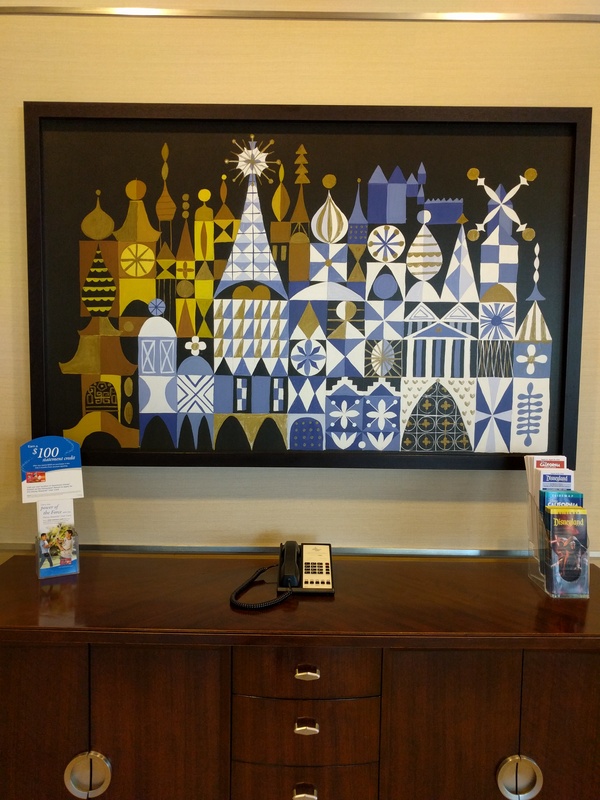 If, like me, you’re a fan of Mary Blair’s art, you’re going to love it here. 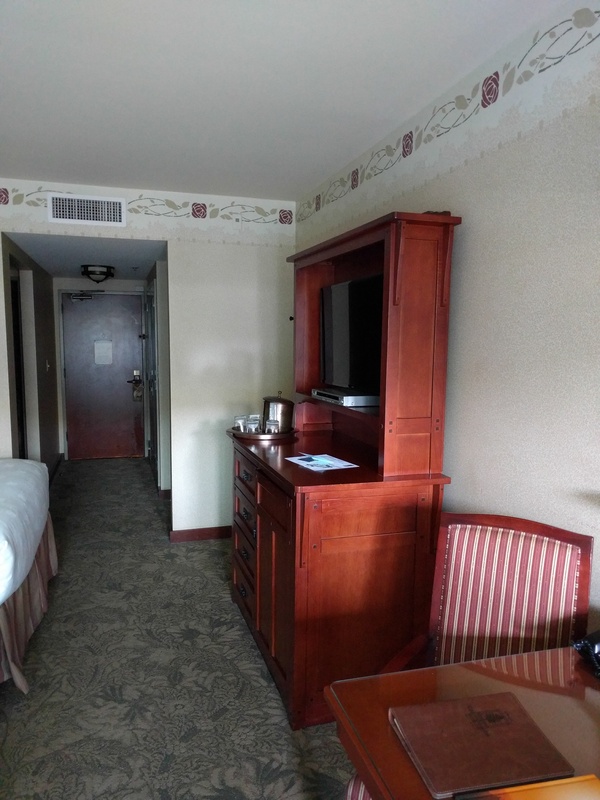 The rooms were decently sized and quite clean and comfortable. 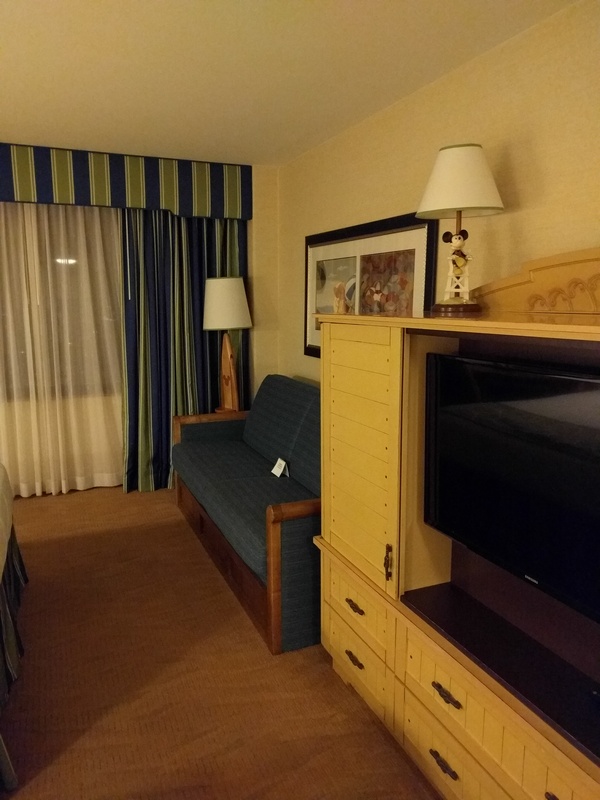 I loved the overall feel of the rooms as well as that wooden carving above the bed! Just beautiful! 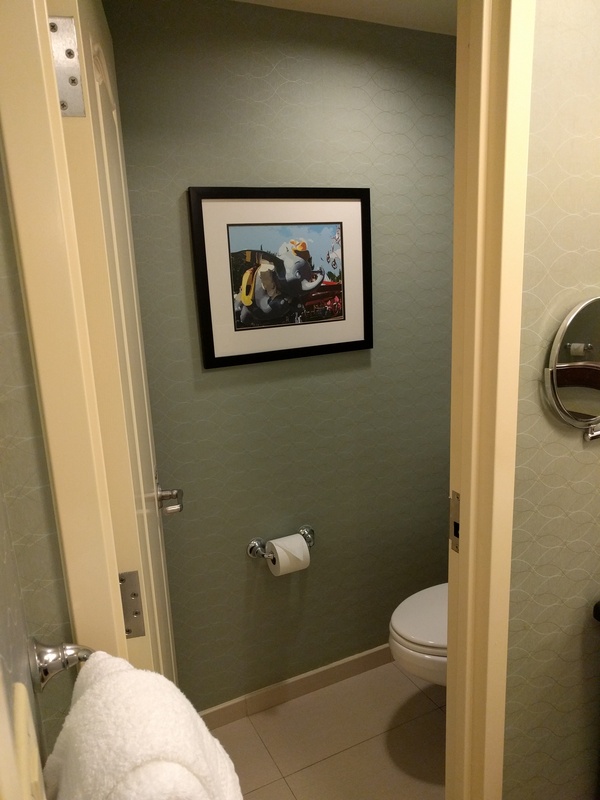 The bathroom is set up in an interesting way. 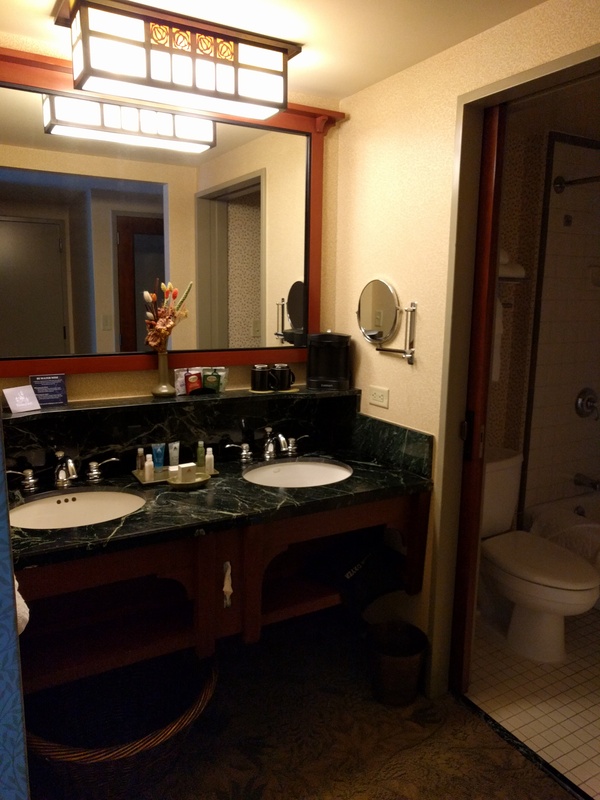 The toilet is in its own little room within the bathroom, but the sink and bath areas are open. That probably works well for families, but for myself and my roommate, it was a little inconvenient. 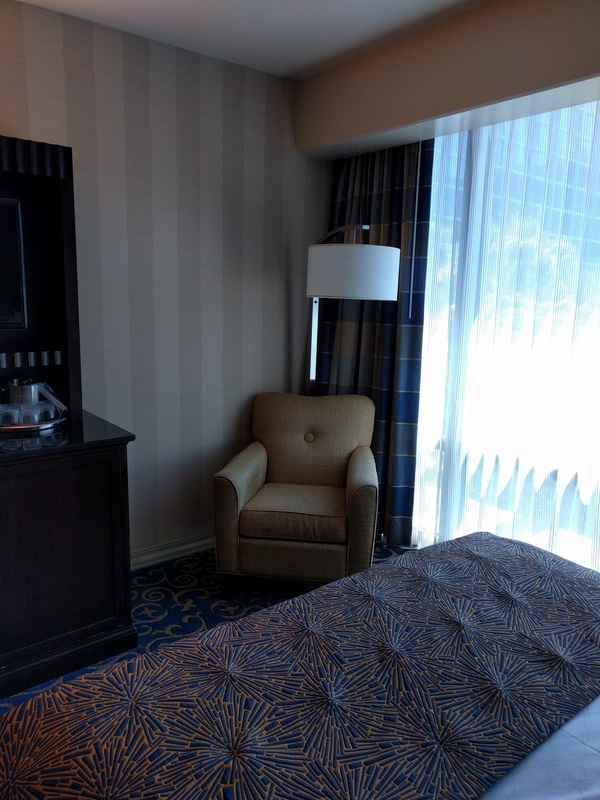 My room was in the main tower, the Fantasy Tower. There are two other towers, Adventure and Frontier Towers. 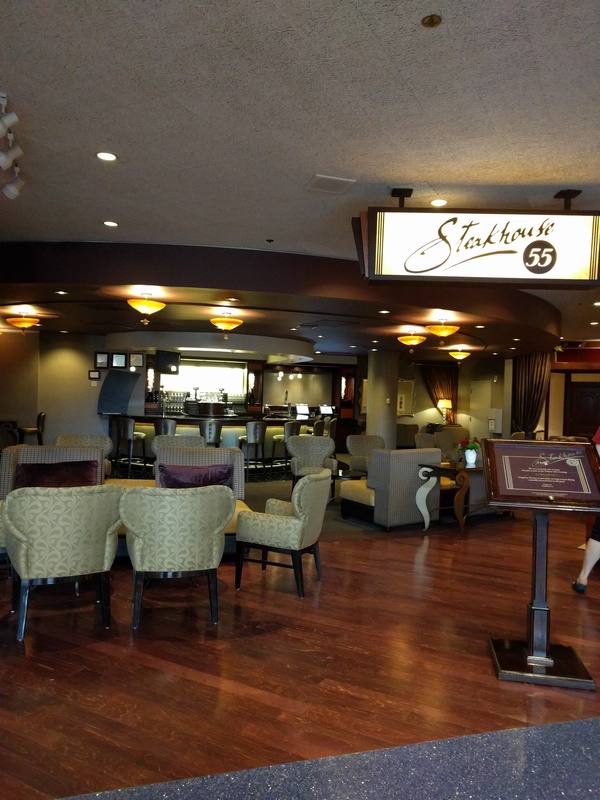 There are also Club Level accommodations here as well as a Club Level lounge that’s wonderful for watching fireworks at night. You really can’t beat the location of this resort. 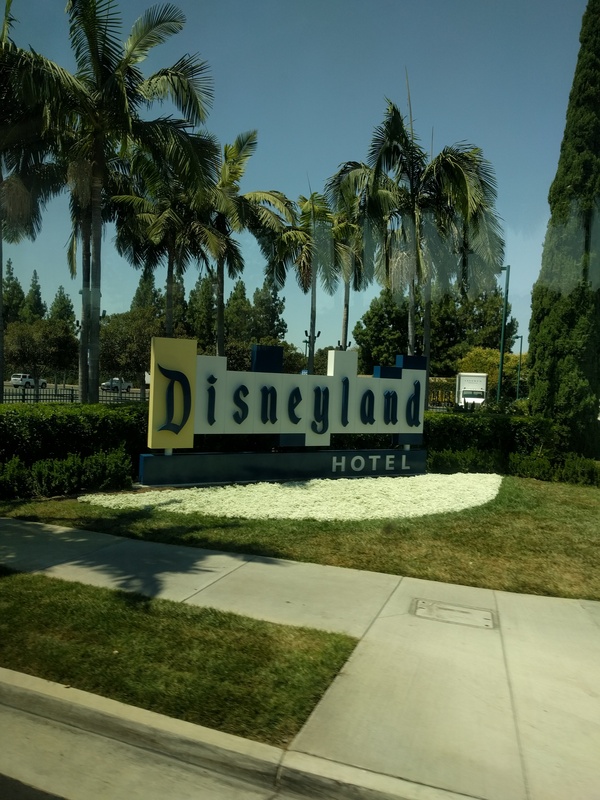 It’s located right at the end of the Downtown Disney area and it takes maybe 5 minutes to walk from the hotel to the park gates. That’s so refreshing to this this girl who’s used to commute times at Walt Disney World! The Disneyland hotel also has Trader Sam’s Grog Grotto, a fun cocktail bar located right outside the pool area. We stopped in for mojitos one night, and unfortunately the main bar was completely packed so we sat out on the patio. The drinks were great! 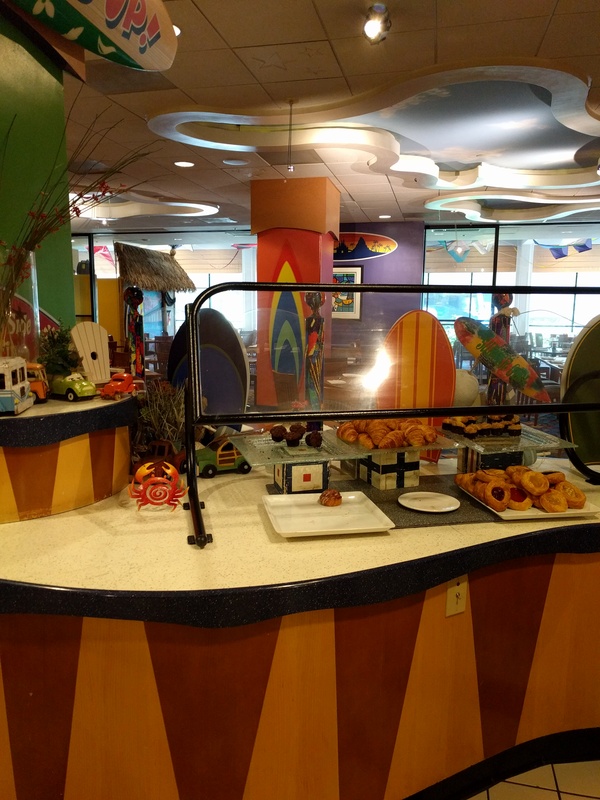 Also located at this resort is the Goofy’s Kitchen character meal as well as the famous Steakhouse 55. 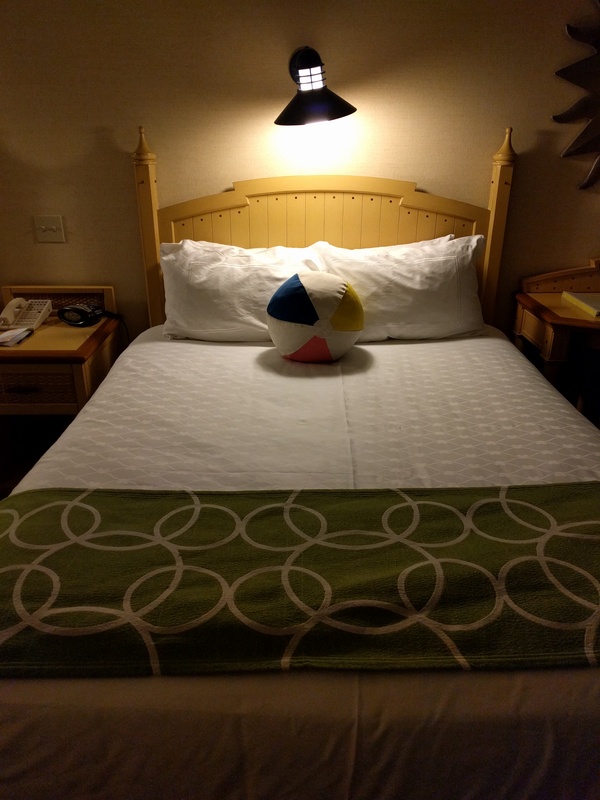 Overall, this resort has a fun and laid back feel. 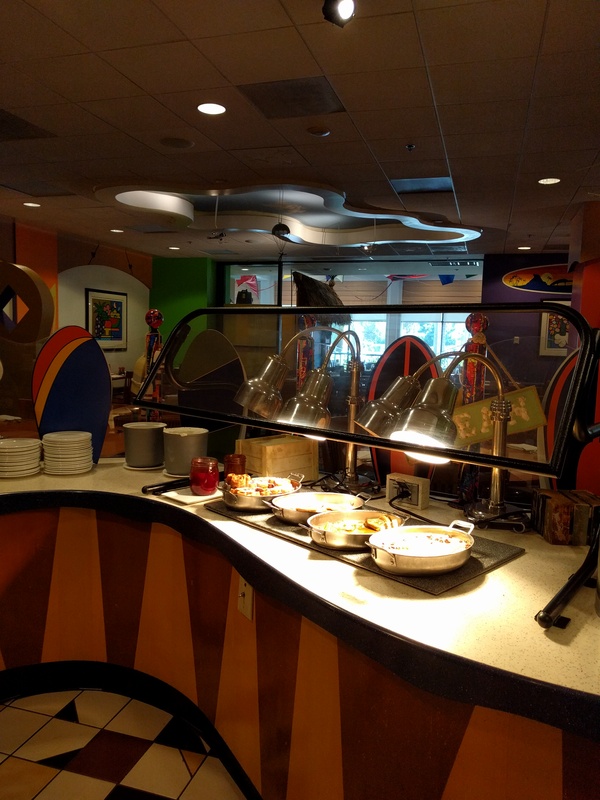 This resort is great for families, couples, and anyone looking for that quintessential Disney feel. 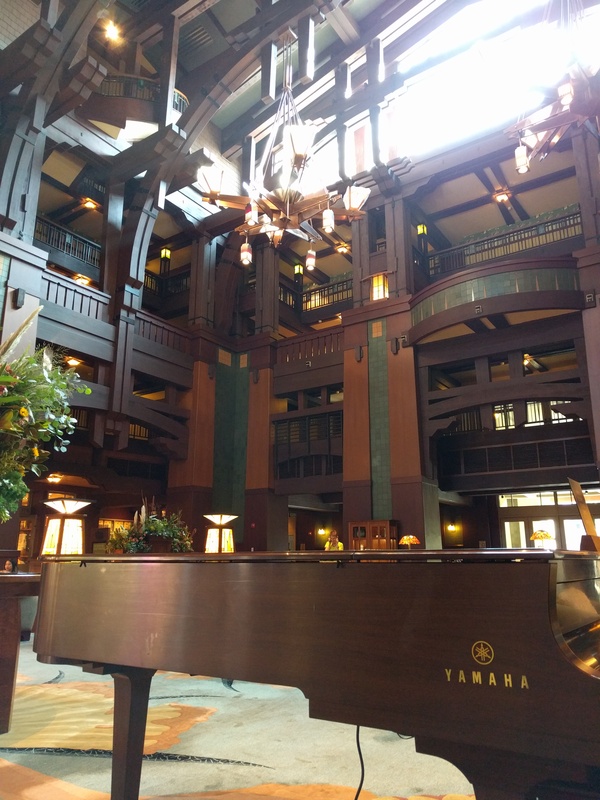 I really thought that Grand Californian was going to be my favorite of the three, but I was quite surprised to find that Disneyland Hotel was my preference! 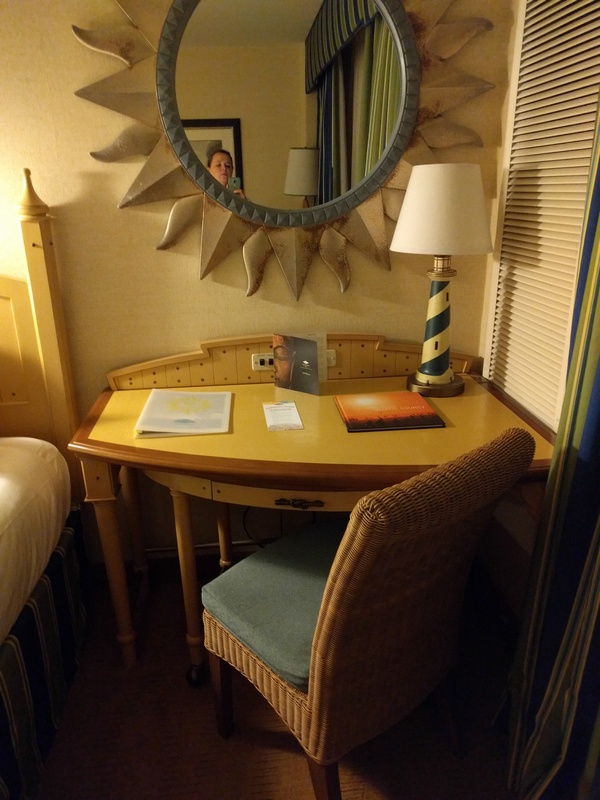 I really loved this resort and I can’t wait to stay here again with my family! 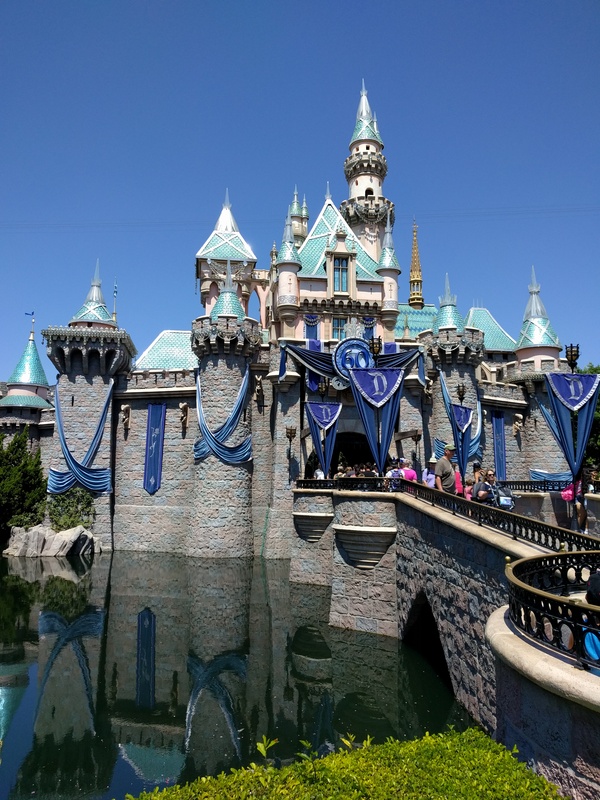 It’s the big 6-0 for Disneyland this year and they are setup to celebrate the Diamond Anniversary. 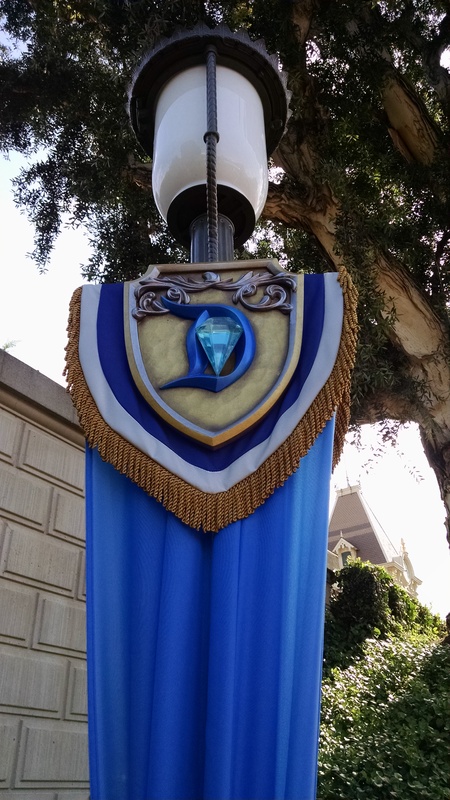 The streets are decked out with the Disney ‘D’ and diamond banners. 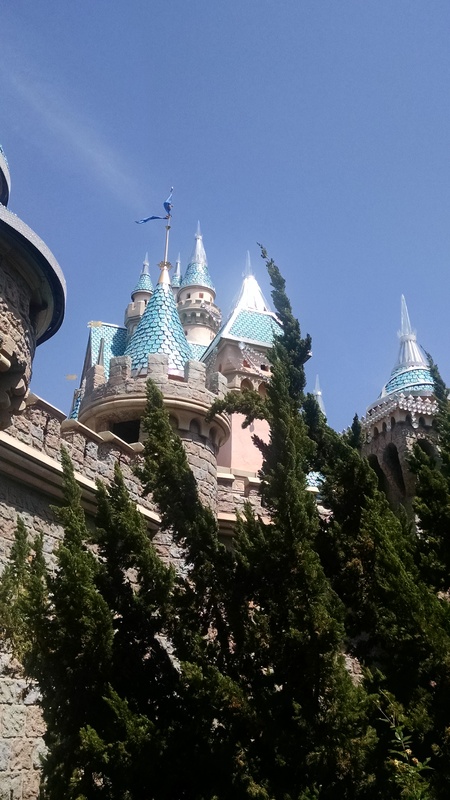 The castle has been given an extra dose of sparkle. If you’ve been wanting to visit Disneyland or haven’t been in a while, now is the time to go. You’ll get to enjoy an extra special Disneyland experience! 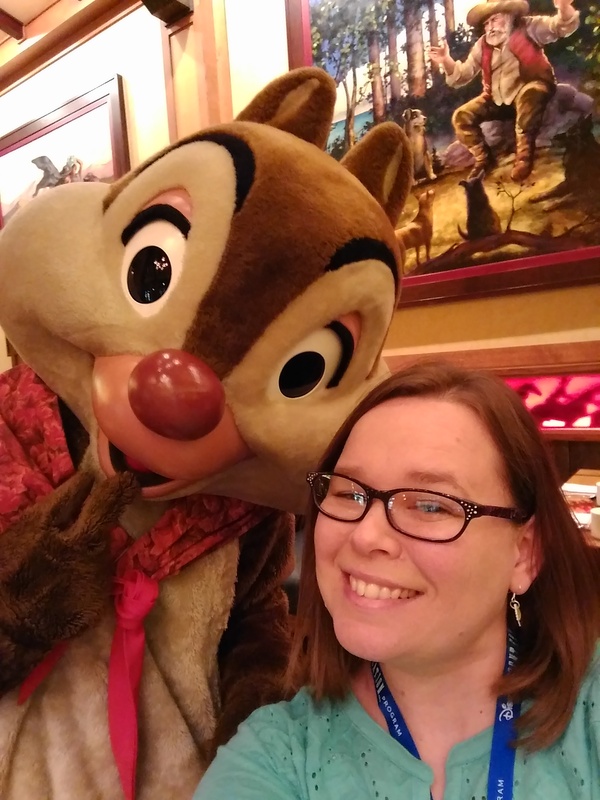 I am disappointed to miss it but we just got back from a visit in May and I haven’t been able to convince the hubs that we should go experience the 60th Anniversary since we already have reservations for our usual Christmas trip in December. The celebration started on May 22nd with a 24 hour celebration at both parks – Disneyland and California Adventure. Both parks were open from 6 am on May 22nd to 6 am on May 23rd. There was an opening celebration on Main Street at 6 am to start off the 24 hours of fun! In addition to the 24 hour celebration, they have created a new parade – Paint the Night, a new night-time show – Disneyland Forever, and a new World of Color show – Celebrate. All geared towards paying homage to the heart of Disneyland and Walt’s dream. They are all sure to be over the top and ready to dazzle the crowds. The new Paint the Night Parade is an updated electrical parade. The Disney Parks blog says “This dazzling nighttime procession is led by Tinker Bell flying in a magical, musical overture, spreading pixie dust along the Disneyland parade route. Right on her tail (but never growing up!) is Peter Pan, perched high atop an enormous drum inspired by a float from the classic “Main Street Electrical Parade.” I’ve heard that this parade is AH-MAZING! I would expect nothing less from Disney. After the parade you’ll be able to witness a new nighttime show that is more than just fireworks. It looks like they are incorporating lasers, video projections along Main Street and other parts of the park along with fireworks. Magical is the only word I can think to describe this and I haven’t even seen it! 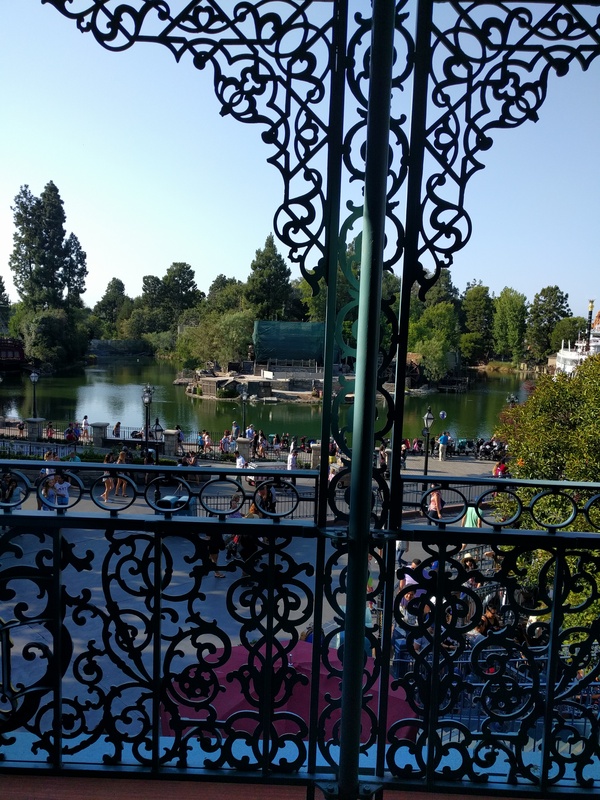 It is 14 minutes of magic that transforms the park and is complimented with a fantastic soundtrack. 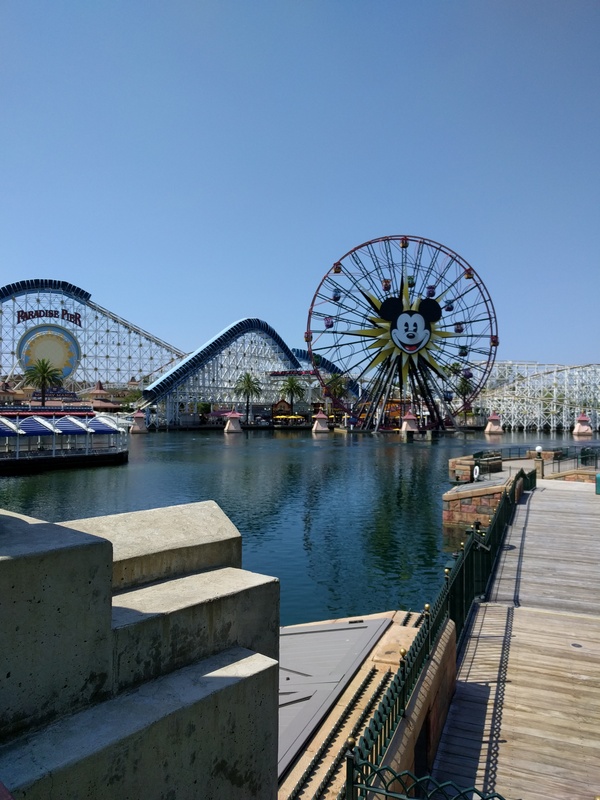 Over at California Adventure, they’ve also updated World of Color. 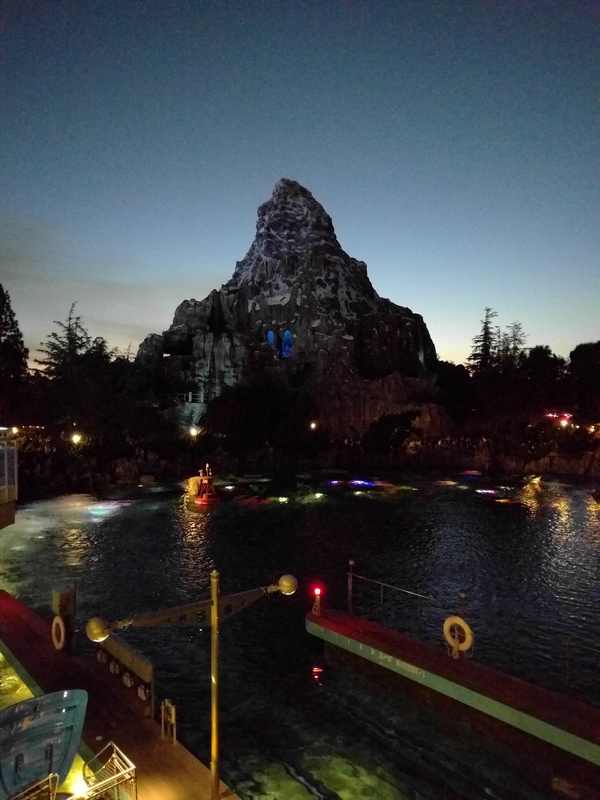 I love World of Color, the fact that they can project images on water and have it look clear and crisp if amazing to me. Maybe I am easily impressed but I think they do a great job presenting it and incorporating so many Disney characters seamlessly into the show! The Disneyland website explains it the best I think “Filled with never-before-seen surprises and dazzling special effects, and hosted by Neil Patrick Harris and the one-and-only Mickey Mouse, it’s an unforgettable opportunity to follow along on Walt’s incredible journey of imagination—from his earliest creations, to his very first visions for The Happiest Place on Earth, to today’s Disney magic… and beyond! 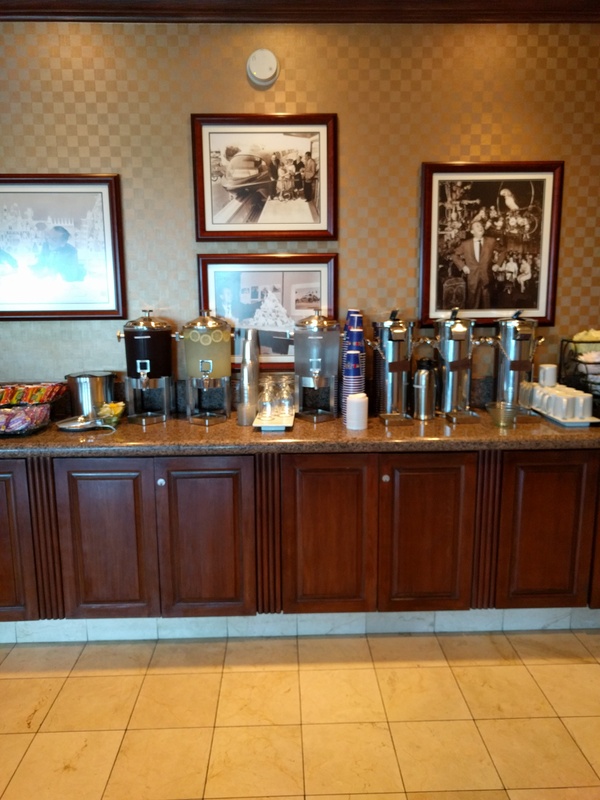 In addition to all the fun shows and entertainment there have added some new food and drinks to celebrate as well. Get a 60th anniversary cupcake, enjoy the yummy 60th anniversary Martini at Carthay Circle Restaurant (make a reservation for dinner you will not be disappointed!). And as a true Disney fanatic you should make sure you accessorize ” the Diamond Celebration Made with Magic Mickey Ear hat, Paint Brush and Mickey Glove—and others you know and love, including the Sorcerer Mickey Wand and Minnie Mouse Headband. So go and enjoy all the magic and fun for the 60th Anniversary!